Challenges associated with E. coli include lengthy purification, protein aggregation, and inefficient refolding. These drawbacks can be overcome with an expression platform from Ajinomoto Althea. This platform, which is based on the Corynebacterium glutamicum organism, is called Corynex® (for CORYNebacterium EXpression system). It synthesizes and secretes properly folded proteins or peptides directly into the extracellular fermentation broth. Since properly folded proteins are recovered directly from the broth without cell lysis, host protein secretion is minimized. And since the expressing organism is a gram-positive bacterium, the system lacks endotoxins, which reduces the likelihood of antigenicity and simplifies purification. Purification of E. coli-expressed proteins typically involves harvest, homogenization, centrifugation, and refolding—and then multiple chromatography and filtration steps. Because the C. glutamicum organism possesses secretory pathways, it expresses properly folded, biologically active proteins directly into the culture medium, thus reducing purification steps and increasing yields. Up to 80% of recombinant proteins expressed in E. coli are contained in inclusion bodies, which form when the overexpressed recombinant proteins aggregate in an insoluble form in the cytoplasm or periplasm. Extracting biologically active protein from these aggregates reduces yield and is a major driver of production costs in microbial processes. Sam Ellis, vice president, Thomson Instrument, says that his company is bucking the “high control” trend in small-scale cell culture. 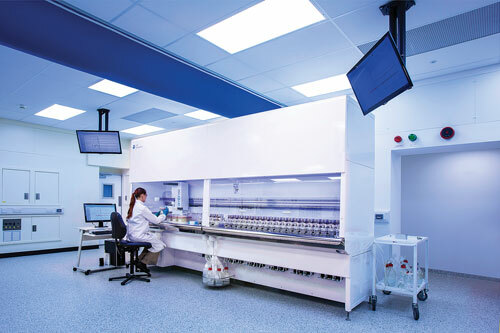 Thomson has adapted the Erlenmeyer flask in a couple of systems—Ultra Yield™ Flasks (for microbial cultures) and Optimum Growth™ Flasks (for HEK293, CHO, and insect cell cultures). In Ellis’ view, uncontrolled cell cultureware is making a comeback because of advances in media, supplementation, and cell-line selection. Rising titers, especially for transient gene expression, have substantially lowered the volumes necessary for generating early preclinical protein. The Amgen data shows the ability to express 40 mg of protein in a 100 mL working volume, a nearly 50-fold improvement over the titers available a decade ago. The paradoxical impact of viruses as both a health threat and as a tool for addressing a growing list of diseases is accelerating. Our ability to keep pace with new trends in viral research has been limited by the lack of progressive manufacturing technologies capable of supporting the rapid increase in production needs. Most noteworthy has been the absence of real-time, in-line analytical methods. In response to this unmet need, ViroCyt® has developed a portfolio of reagents enabling immediate, biologically-specific quantification of viruses dramatically faster than traditional methods, according to Michael Artinger, Ph.D. (martinger@virocyt.com), vp, marketing & strategic partnering. Marketed under the tradename ViroTag®, this new product category utilizes a fluorescently labeled, high-affinity antibody targeted to the virus of interest. During a one-minute sample analysis, the preparation is evaluated using the Virus Counter® 3100, an instrument developed solely for the purpose of virus quantification. The first two members of the ViroTag family to be launched target Baculovirus (ViroTag BCVB) and Adenovirus (ViroTag ADVX), selected based upon the significant roles these viruses play in the protein expression and gene therapy fields, respectively.